I didn't understand. 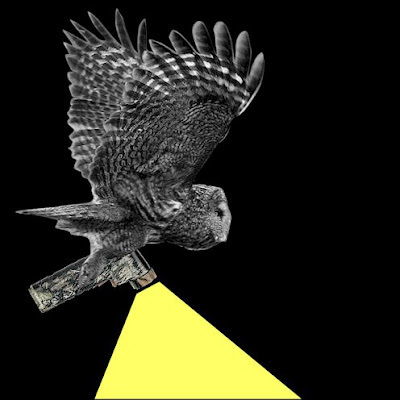 Was the flashlight a carnivore? In that case I really didn't want one. Was the flashlight for carnivores? 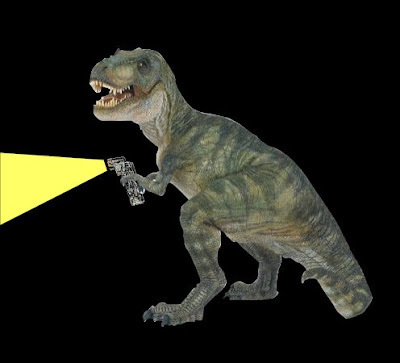 What kind of carnivores use flashlights? The grandaddy of them all, the mighty T-Rex? 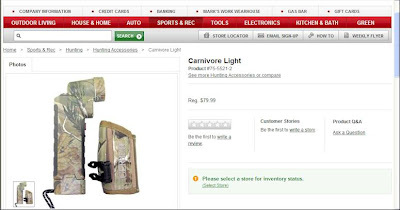 And what carnivore other than Venus Flytrap would have $80 for a flashlight anyway? Well, I gave my head a shake and stopped thinking such crazy thoughts and read about the flashlight. Turns out it is a "blood tracking" flashlight that can help illuminate blood traces, helping hunters to find game that has been wounded. I went deer hunting once with a friend and his Dad as a teenager, and found that I couldn't pull the trigger. Still, I have no problem with responsible hunters. Some of you may find that kind of gross, but to my mind wounded game is better off found than left to suffer off in the bush somewhere. Still, "carnivore?" Gerber, the maker of the light, also sell an "omnivore" model that doesn't have the blood tracking lights. Going with that logic, I think they should introduce the "herbivore" or "vegan" or maybe the "Veggie Lite", a flashlight for wildlife photographers. 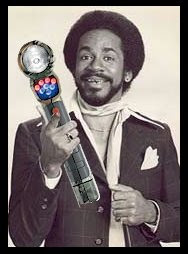 Some of you may be thinking, "what the hell is Rantwick writing about this stupid flashlight for? This has nothing to do with cycling!" There are two points I would like to make in this regard. Firstly, the beauty of writing a blog, whether it appears to have a theme or not, is that I can write about whatever I please. The blog isn't called "cycling stuff", it's called RANTWICK, which means I can be as selfish and random with my subject matter as I wish. I really like that, and my hope is that other people enjoy a change of pace now and then too. 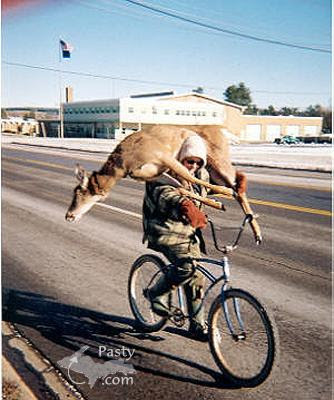 Second of all, hunting and cycling sometimes do go together. Like I said, I'm going camping and we're leaving Friday morning. That means that there's a ton to do over the next few days that doesn't include blogging. Going by this post, perhaps a little blog break will be a good thing! Anyway, I'm gonna vanish from this space for about a week. Note: in case you were considering the carnivore for your blood tracking needs, you should know that it is powered by 4 AA batteries, so it isn't nearly as big as it looks in some of my photoshopped pictures. I lol'ed several times while reading this... great post. Funny! You do need a vacation! I didn't know deer were fixie enthusiasts. I biked on Sunday with a wheeled luggage bag beside me as a "side car" attached only to my hand. I wasn't able to go very fast, but it worked well, but was tiring on the arm. Have a great time! Feed those insects! We may tell ourselves that we are at the top of the food chain, but mosquitoes know better! Doohickie and Jeff - Thanks! 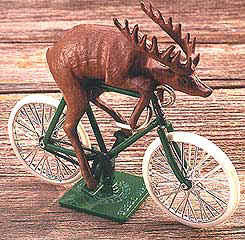 CS - Fixed gears are the most "natural" of bikes, so its no wonder deer choose them. Saskboy - How far did you go that way? It is indeed mrs. Rantwick, plus my two little Rantwicks and one other child who is not of the Rantwick bloodline. About 8 blocks in residential neighbourhood. When you're pulling a rollie suitcase beside you bike for 8 blocks, living on the prarie is a great blessing, I would think. Yes, no hills in this neighbourhood. Good thing I'm not in Moose Jaw though. This post was very funny! BTW, I been to your neck of the woods, back in 1992, when I visited UWO for a conference. Keep up the funny posts! Come back, Rantwick! I miss your posts!